Our Delgado office furniture comprises a striking range of ultra-cool and distinctive pieces. 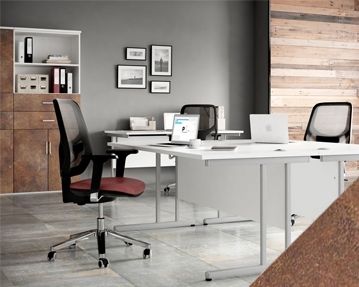 In addition to the reliable, durable and comfortable workstations characteristic of our collections, Delgado office desks can be enhanced with funky textured metallic-effect front pieces. Choose from concrete, pitted steel, rusted steel or platinum oak front panels to add a personal and contemporary touch to your workspace. 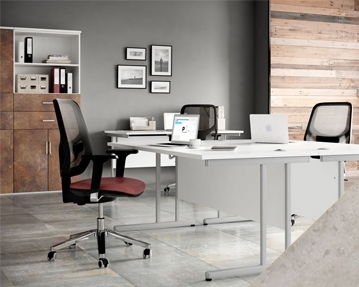 Delgado office desks are made of hardy melamine and, in addition to rectangular desks, they come in a range of sizes and configurations, including left-handed or right-handed orientations, corner desks and ergonomic styles. The desks are equipped with two or three cable ports to keep work spaces safe and tidy. They can also be accessorised with lockable Delgado office pedestals. The sleek lines of the handles and adjustable feet provide a stylish finish to this collection. 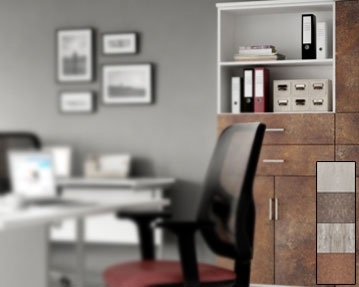 As well as desks and pedestals, this range includes attractive and practical bookcases, cupboards and filing cabinets. Our Delgado office furniture comes with a 10 year warranty and is easy to look after. If you think this might be the right collection to bring a sassy edge to your workplace, why not get in touch with us today? Our experts can be contacted by phone or via our online enquiry form to discuss your needs with you.